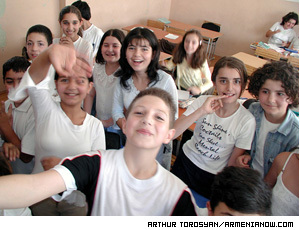 When the juniors of secondary school No 83 are asked if they are happy to live in an independent Armenia they confidently say "yes". It perplexes them when they are asked why. Some laugh and reply: "Because we live in an independent state." "I'm a person who has respect for promises, I don't smoke, sometimes I drink. I wish to meet a thoughtful man devoted to his family." "I'm a kind, communicative and hospitable woman. I'm interested in sports, I like to dance and I cook very well, sometimes I smoke and sometimes I drink. I wish to meet a communicative, kind, clever man devoted to his family." Festive week is a correct description for these seven days of beautiful Armenian autumn. Three significant occasions, "Kenats" annual festival, "Sayat Nova" All-Armenian Best Song Award and Swiss - Armenian cultural events are taking place in Yerevan. The threat posed by the AIDS virus was highlighted in bright colors at the Yerevan Hay-Art cultural center on September 18. With posters bearing slogans such as "Let's wipe out AIDS together", "You are not alone", and "Don't harm your health for pleasure", young and professional painters sought to bring awareness of the problem while offering support to sufferers who feel isolated from society. The inscription "Welcome to Armenia, an Outdoor Museum" is included in the booklets published by artist Azat Sargsyan. In those booklets one can find his photos where he, dressed in black clothes with the word "welcome" written on them, stands next to different graves in Yerevan cemeteries. Six Armenian contestants were among 587 fighters from 97 countries who took part in the 2003 World Judo Championships.